(seen at the afternoon performance on 16th May 2018). 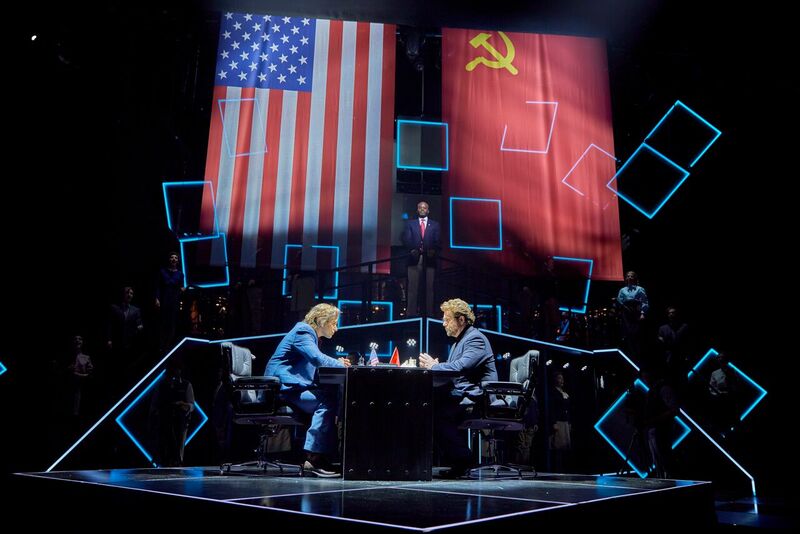 To paraphrase Tim Rice’s usual sparky lyrics, ‘each production of “Chess” means there is one less variation less to be played.’ This one is quite clearly the “let’s not take ourselves too seriously” gambit. If it isn’t, then it really should be. With any luck, Stephen Mear will choreograph the Palladium’s panto this year. 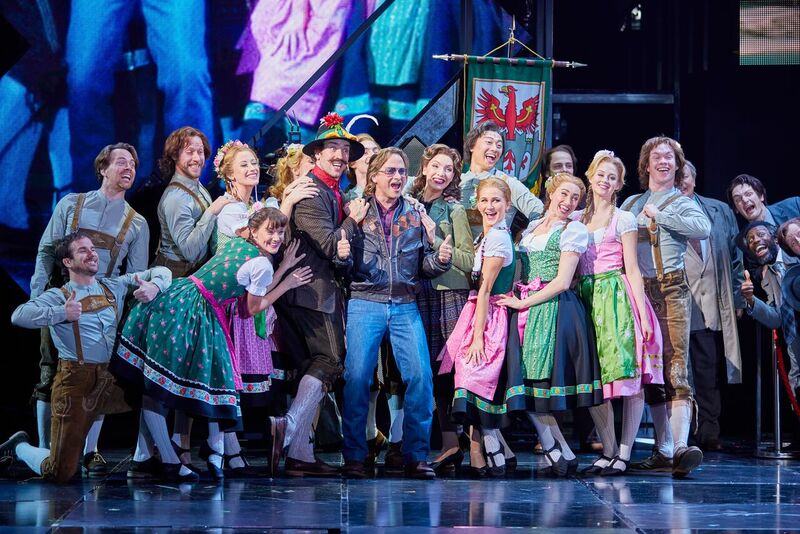 Surely nobody else on the planet could come up with more hilarious tepsichorials than his staging of “Merano” as (rather attractive) chorus members bound about in a “Heidi on Schnapps” way. Almost topping that, the Soviet* Army is in huge trouble if that’s how they march – making Julian Clary look like Rambo; while the final “walkdown” at the end is clearly representing after the board has been upset. Luckily, the “Embassy Lament” has an amusing moment – but also a jarringly sexist one with the men treating the women as coat-stands. Video designer Terry Scruby is clearly in on the fun, with smart animations but an odd “mirror effect” (possibly intentional, but distracting) and sound sometimes out-of-synch with the action. Lighting designer Patrick Woodroffe’s “tease the cat” blobs for “Where I Want To Be” are amusing, but even better is designer Matt Kinley’s “earthquake simulator” downstage lift, that shakes most convincingly as soon as it is stepped on. There are some pretty good intentional jokes too SPOILER ALERT the best being “Thank You For The Music” by a jet-setting accordion player, and the sad tale of an American tourist in Bangkok. Watch for both. SPOILER ENDS. Sadly, some may throw accusations of “Cultural Appropriation” at the sequence (it can’t be beyond budget to find actual Thai actors, surely) but that is by the by. On the upside, they’ve pretty much solved the complications of the second act book, by removing most of it and leaving a linear story. Not saying it is interesting any more, but it is at least clear. Director Laurence Connor also makes a very brave attempt at “I Know Him So Well.” The concept makes sense, but sadly the emotion is lost by the use of two very different settings that keep the women too far apart for such an intimate number. Opponent Tim Howar (Freddie Trumper) is equally impressive, his “Pity The Child” holding centre stage in iron grip. Cedric Neal (Arbiter) is also in good voice, maintaining a firm line. Philip Browne (Molokov) manages likewise, credible ideologist with gravity. 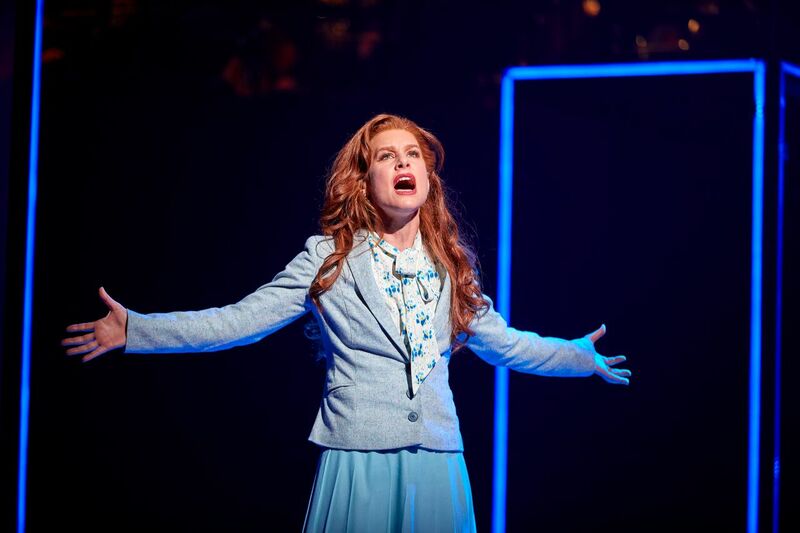 Cassidy Janson (Florence Vassy) shows her usual musical theatre skill, “Heaven Help My Heart” landing as it should. At this performance, I did wonder if her voice was all right, as she swallowed the odd syllable in a way she never usually does – well done for singing through the illness if so. 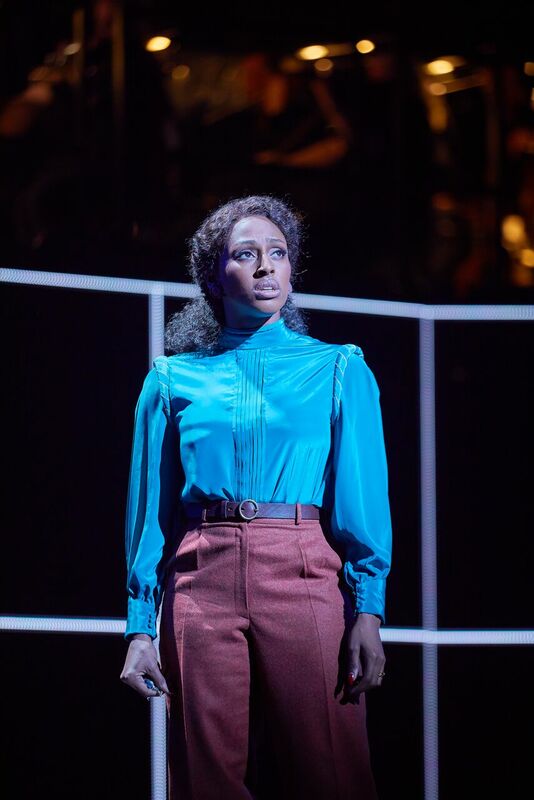 Alexandra Burke (Svetlana Sergievsky) is less experienced, and only that is the reason she could not always figure a way out of the static situations she was put into. Her “Someone Else’s Story” was static – vocally decent, but only half acted. Later scenes demonstrated that the skills are there, but on this occasion only sporadically harvested. Money was invested in this, and it did fill the stage. 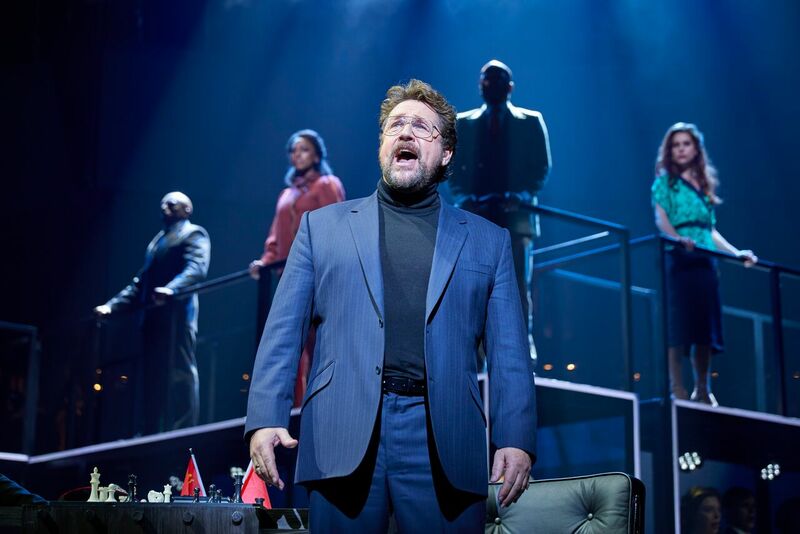 It is also probably the most comprehensible version of the show to date, and the orchestral sound possibly definitive. 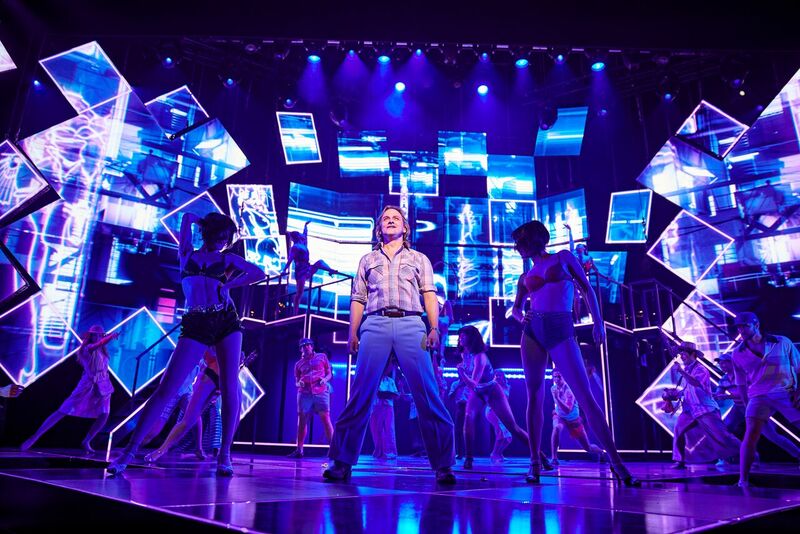 Unfortunately, it also rather confirms that the show isn’t the strongest, and will, like “Mack and Mabel,” be one known for a few numbers rather than a cohesive classic. Unintentionally amusing, but well-meaning and done with spirited gusto. Not Russian at that time – as helpfully corrected by Moscow reader Stasia. Photography credit: Bringkoff Mogenburg. Used by kind permission. On a blog break next week, back blogging on 6th June.